This classic IVP resource is now being completely retypeset and presented in a fresh, new large paperback format for the twenty-first century. All the volumes are being re-issued, beginning in February 2008 with the Pentateuch and the Gospels, and finishing in spring 2009. The introduction to each volume is a concise yet thorough description of the authorship, date, and historical background of the book under consideration. The commentary itself examines the text section by section, drawing out its main themes. It also comments on individual verses and deals with problems of interpretation. 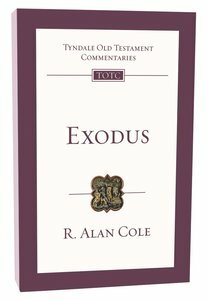 About "Exodus (Re-Formatted) (Tyndale Old Testament Commentary Re-issued/revised Series)"
R. Alan Cole (Ph.D.,Trinity College, University of Dublin) was a classical and biblical scholar, a teacher at Oakhill Theological College London, Moore College Sydney, St Peters Hall and Trinity College Singapore, a missionary with both the China Inland Mission and Church Missionary Society in South-East Asia, Founding Master of Robert Menzies College at Macquarie University, sydney and Federal Secretary of CMS (Australia). He was also the author of the Tyndale New Testament Commentary series volumes Mark and Galatians, and Exodus in the Tyndale Old Testament Commentary series.